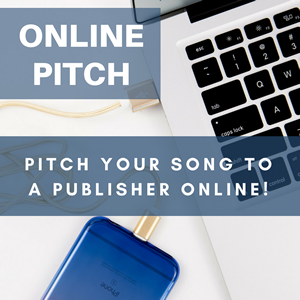 Want to pitch your song to a publisher? With membership, you receive (2) Online Pitch opportunities (in the form of credits on your account) to use throughout your membership year! Through our Online Pitch service, you will be able to pitch your song to an industry representative from the comfort of your own home. This is a great platform to get a publisher's attention by showing off your songs! STEP 1 - Register one song (.mp3 & lyrics) for an Online Pitch session prior to the event at about 10am CST. Registration fills up very quickly, often within 48 hours, so submit as soon as possible! STEP 2 - The industry guest will listen through a verse and chorus of each song. They will either "pass" or "take a copy" of your song. We video record this; there is no attendance or live stream for the actual session. STEP 3 - On the day of the event around 5pm CST you will receive an email with a video link of the pre-recorded Online Pitch Session to watch at your convenience! STEP 4 - If the guest opted to "take a copy" of your song, we will provide them with the MP3, lyric sheet, and your contact information. **We do not guarantee the guest will contact you, and we are unable to give you their contact info. **The guest in no way owns your material through this service. Questions about Online Pitch? Email Erin at erin@nashvillesongwriters.com.